Kountze High School Fred Boykin (No. 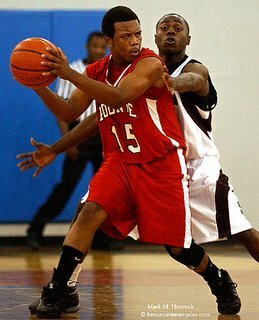 15, left) tries to keep the ball away from Silsbee High School's Kenneth Lockett (No. 11, right) during the Fred Williams Classic basketball tournament at Ozen High School in Beaumont on Friday, Nov. 25, 2005. Sisters-in-law Amy Moore of Bridge City (left) and Christine Moore of Orange (right) take a break from shopping at Parkdale Mall in Beaumont on Friday, Nov. 25, 2005. Mauriceville residents Johnny Martin (right) and his sister Christina Holt, 12, (left) take a break from shopping at Parkdale Mall in Beaumont on Black Friday. Martin broke both of his legs when he fell from a tree while trying to recover from Hurricane Rita. 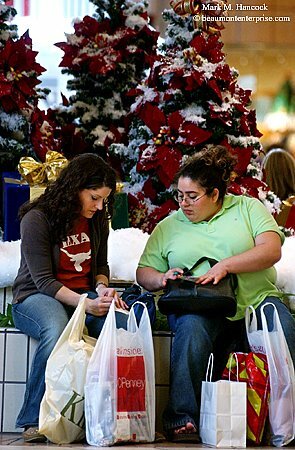 Kaylard LeBouef (left) and Leah LeBouef (right) take a break from shopping at Parkdale Mall in Beaumont. "Black Friday" is the shopping day following Thanksgiving. For many retailers, it marks the day a business begins operating at a profit for the year (i.e. black ink). 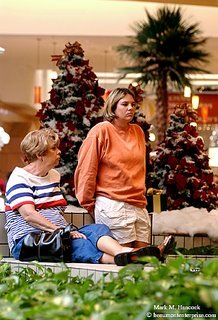 Beaumont's Black Friday was somber following the expenses involved with hurricanes Katrina and Rita. By the afternoon shopper fatigue was obvious and some shoppers were still empty handed. However, some recovery workers are expecting their best holiday ever after logging many overtime hours. Not much has changed in Cameron, La. Since the last time we visited. Houses had been removed from roadways, but personal homes still remained as artifacts of a hurricane's destruction. The area is still off limits to residents. Only emergency personnel and specific contractors are allowed into the area. Some signs of the future are visible. The ferry runs regularly. Birds are hunting in the marshes again. Dolphins breach the canal for air as they hunt for fish. However, it will be a long time before anything close to "normal" returns. The court house is still surrounded by FEMA tents and portable toilets. Without customers, there's no point in shops rebuilding. Water and electricity run in some places, but there is no gasoline, food or other means to survive. As the rain begins to fall, the dried dirt becomes mud again. 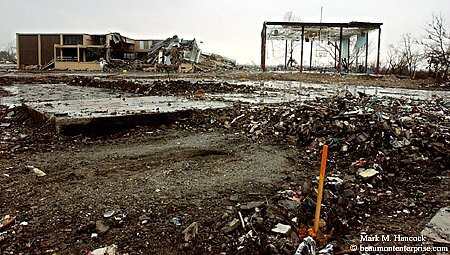 The stench of dried, dead animals is refreshed and the unsettling quietness, isolation from safety and destroyed surroundings make every storm more menacing. A truck remains trapped under a house in Cameron, La. on Saturday, Nov. 26, 2005. The parish got as much as 15 feet of storm surge during Hurricane Rita and is trying to get property owners to submit right-of-entry forms so U.S. Corps of Army Engineers can demolish most houses. 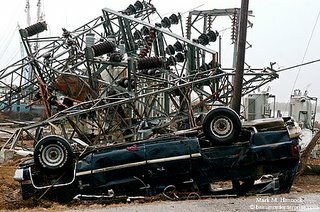 An overturned truck remains next to a destroyed power transmission terminal in Cameron, La. 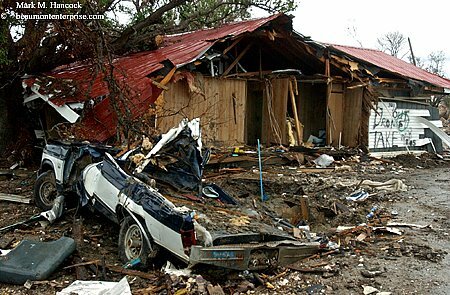 A truck remains destroyed by a house marked for demolition in Cameron, La. An alligator decays by a destroyed house in Cameron, La. 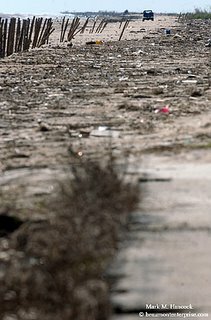 Destroyed trucks remains scattered throughout Cameron, La. 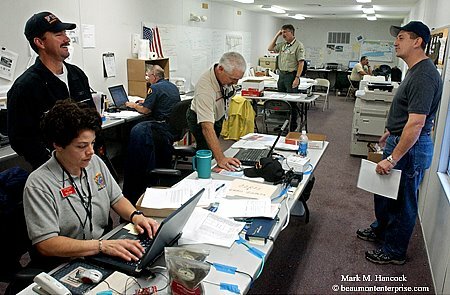 Clifton Hebert, Cameron Parish's emergency operations center operations chief, (right) lightens the mood in the planning trailer in Cameron, La. Clifton Hebert, Cameron Parish's emergency operations center operations chief, (right) walks past the remains of his home in Cameron, La. 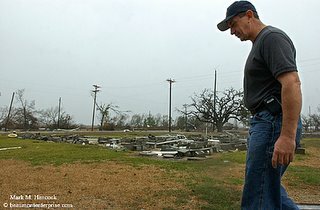 He believes his neighborhood was destroyed by tornados before the storm surge carried away the debris. Charles Primeaux, Jr. shovels inches of mud from his home in Cameron, La. His home is one of very few which can be rebuilt. It was originally constructed in the 1930s of shipgrade lumber. 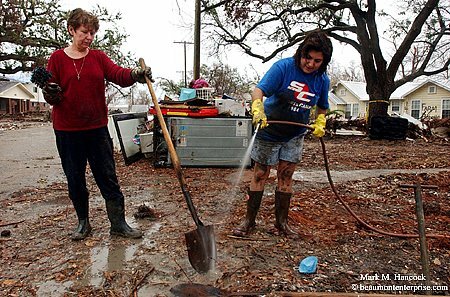 Patty Cope of Houston (left) holds a shovel as her daughter, Jenny Broussard (right), cleans it in Cameron, La. They were trying to open a clogged sewage line. Jenny Broussard (right) checks her boots after her mother Patty Cope of Houston (left) spray-cleaned them in Cameron, La. They borrowed a neighbor's hose as water to Broussard's home no longer ran. Some areas show modest improvement. 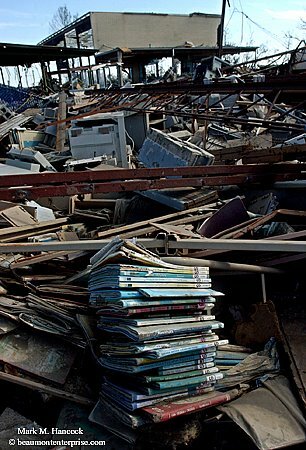 Debris from the Cameron Parish Library has been removed by the U.S. Corps of Army Engineers in Cameron, La. Vehicles travel down Louisiana Highway 27 through the Sabine National Wildlife Refuge near Holly Beach during a storm. 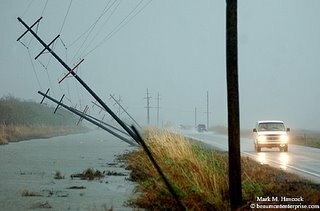 Power line poles erected since Hurricane Rita begin to slide into the water as tornado warnings were issued for Cameron Parish. Each step forward in the area seems to be accompanied with a half-step backward. 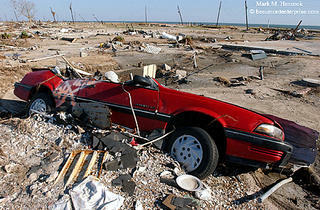 A Pontiac Sunbird remains trapped in sand and other debris in Holly Beach, La. 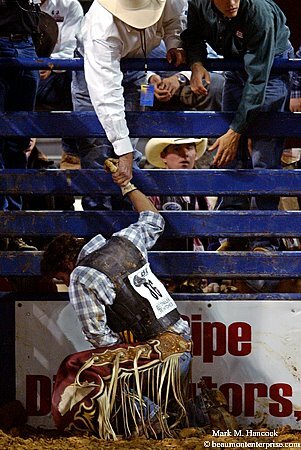 on Oct. 21, 2005. Holly Beach was eliminated in swarms of tornados and storm surge when Hurricane Rita hit. This entry is for folks from Southwest Louisiana. Below you'll find links to the photos and entries my wife and I have created about SWLA since Hurricane Rita. To keep coverage uniform in the area, The Beaumont Enterprise allowed me to adopt SWLA. 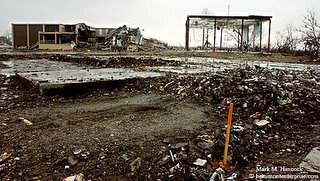 Consequently, most images from the area appear in this blog. Christine Rappleye is the news reporter who works with me in the area. You can e-mail your story ideas directly to her. 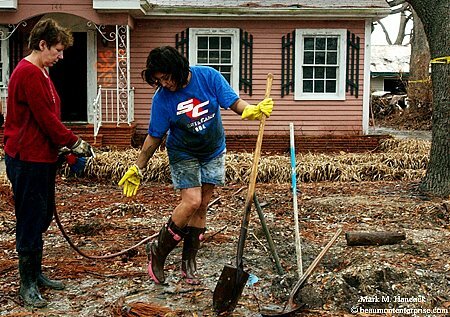 We all look forward to working with you to rebuild Southwest Louisiana. We've discussed making correct exposures under available light conditions. Anyone can do this with varying success. Now we're going to discuss one of the key ingredients to separate pros from amateurs - artificial light (flash). As we've determined, the flash is a critical part of photojournalism. When there is no light, it's impossible to make a photograph. At times, a flash becomes the only light source available. Even available-light purists must use a flash or go home without an image (not an option for a deadline PJ). It's easy to talk about the marvels of through-the-lens (TTL) flash metering. It allows PJs to operate with speed and accuracy most of the time. However, the flash may fail in TTL mode while on assignment. Likewise, a complicated lighting scheme may require the PJ to make manual calculations. Consequently, PJs must know how to handle the situation, or they'll fail. Many people avoid flash because the terms and mathematics sound complicated. At first it is. With a little practice, it becomes second nature and frequently the PJ can use previous experience to "guess" the correct exposure on the first try. However, it's still advisable to double-check with both a flash meter as well as a quick manual calculation (not to mention chimping). The following are critical definitions while working with flash. We'll keep referring to the terms, so they need to be understood. Once we need to change EV ratios with flash, lack of understanding these terms leaves some people in the dust. The next step is basic calculus. It'll leave even more folks scratching their heads. But let's not rush into it yet. If anyone's eyes ever glaze over when talking about photography, it's now. Consequently, I'll simply give the terms, definitions and some practical equipment testing advice today. We'll talk about how to use a flash later. Hang in there, it's worth it. An f-stop expresses a focal ratio of the aperture diameter to the effective focal length of the lens. For example, f/8 represents a diaphragm aperture diameter that is one-eighth of the focal length. For a 50mm lens, the opening would be about 6.25mm at f/8 (50 / 8 = 6.25 or 6.25 * 8 = 50). The effective focal length varies with zoom lenses. The guide number is a numeric value for the amount of light emitted from a flash (flash output). It's represented in whole numbers. By knowing a flash unit's GN, PJs can determine the correct exposure for any subject at a known distance from the flash. Don't trust the manufacturers suggested guide number. Instead do your own equipment calibration at 10 feet. At 10 feet (FD for this example), fire the flash at the flash meter. Multiply the f-stop by 10, and it'll be the correct guide number for the flash. This calculation should also be done for various flash attachments (softboxes) and gel combinations to understand all possibilities. The flash-to-subject distance is literally the distance light must travel from the flash to the subject. This distance includes the distance to a bouncing surface (a wall or ceiling) and the distance from the bouncing source to the subject. Unless the flash is on-camera and directly pointed at the subject (yuck), it'll almost always be different than the camera-to-subject distance. With an accurate GN, PJs can correctly calculate exposures with a flash set on manual (or fired with remote, slave or pc-sync). To calculate the correct exposure, establish the flash-to-subject distance (FD). Next divide the GN by the FD to get the correct f-stop. 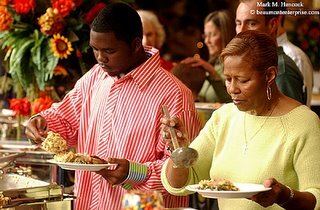 Beaumont residents David Sublett (left) and Anaiebell Davis (right) prepare their Thanksgiving meal at the MCM Elegante Hotel in Beaumont on Thursday, Nov. 24, 2005. 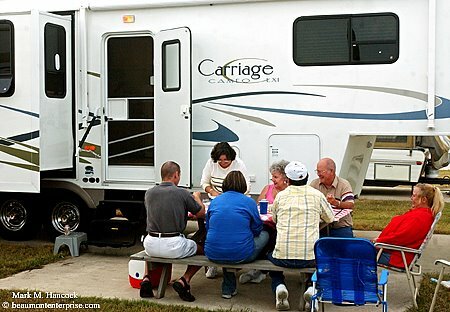 They said the hotel provided an easier option for a traditional Thanksgiving dinner. 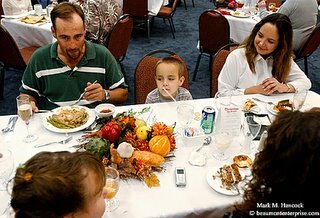 Paul Ryan (from left to right) of Fort Worth enjoys a Thanksgiving meal with his wife Angie Ryan and daughter Sarah Ryan, 10, at the MCM Elegante Hotel. 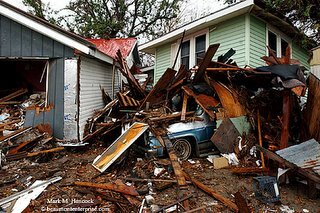 Paul Ryan works for AT&T (formerly SBC) and is helping with Hurricane Rita recovery. His family traveled to Beaumont to be with him for the holiday. Pete Harrington (left) and his wife Shelly Harrington (right) have a champaign Thanksgiving meal with their family Dylan Harrington, 5, (center) Melanie Harrington, 9, (lower left) and Katie Kinney, 18, (lower right) at the MCM Elegante Hotel. The family currently lives in a FEMA-provided trailer until their Groves, Texas home is repaired. 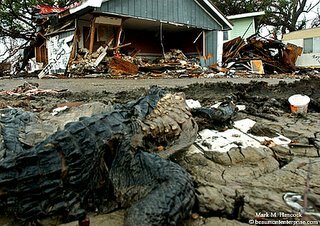 Their home was destroyed by Hurricane Rita. 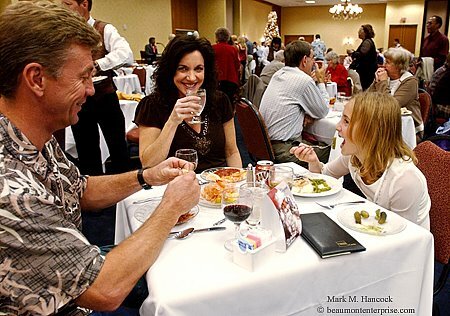 The family of Ruth Mattox (center in pink) of Beaumont have a laugh over dessert after a Thanksgiving meal at the Gulf Coast RV Resort in Beaumont. The family had Thanksgiving dinner at the trailer because the Beaumont home of Ruth Mattox, the family matriarch, has mold and was seriously damaged and by Hurricane Rita. West Brook High School's Will Wilson (No. 31, right) uses his head to deflect a pass intended for Clear Creek High School's Austin Yancy (No. 17, left) during a playoff football game at Galena Park ISD Stadium in Houston on Saturday, Nov. 19, 2005. 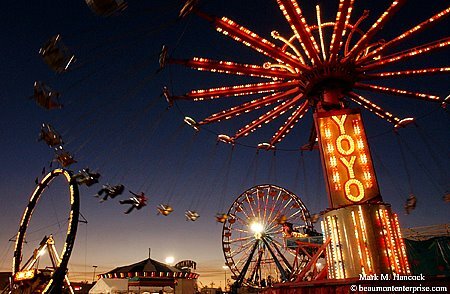 Carnival attendees scream as they ride the YoYo at the Todd Armstrong Shows, Inc. carnival in the parking lot of Parkdale Mall in Beaumont on Tuesday, Nov. 22, 2005. 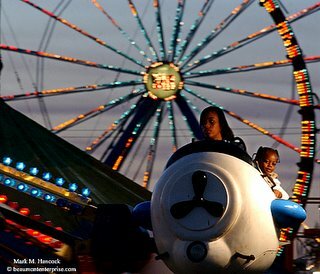 Tekedra Holland, 17, (left) and her cousin Troyvon Tillman, 3, take a play plane ride at the Todd Armstrong Shows, Inc. carnival in the parking lot of Parkdale Mall in Beaumont. 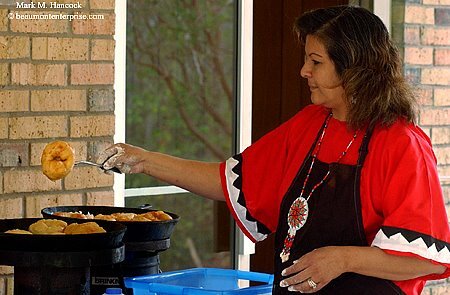 Cherise Williams, 4, (right) licks her lips as her grandmother Sarah Williams (left) prepares a turkey during Indian Day at the Indian Village Assembly of God church near the Alabama-Coushatta reservation on Sunday, Nov. 20, 2005. Judy Williams prepares Indian fry bread during Indian Day at the Indian Village Assembly of God church near the Alabama-Coushatta reservation. 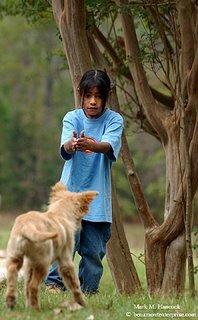 (Right) Sage Williams, 6, calls for a stray dog as he waits for lunch during Indian Day at the Indian Village Assembly of God church in Livingston. (Below) The Rev. 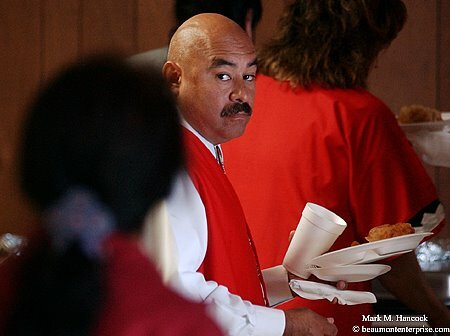 Rudy Martinez keeps an eye on everyone as he gets food during Indian Day at the Indian Village Assembly of God church. 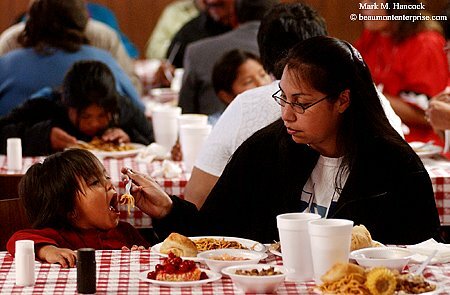 Angel Beene (right) feeds her son Seth Williams, 21 months, (left) during Indian Day at the Indian Village Assembly of God church near the Alabama-Coushatta reservation. 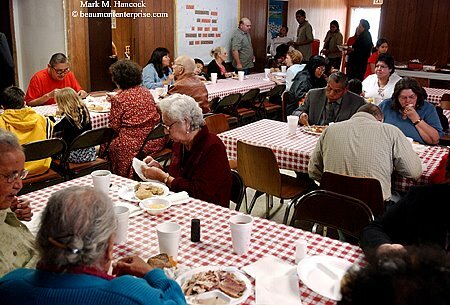 Church attendees share a meal during Indian Day at the Indian Village Assembly of God church. 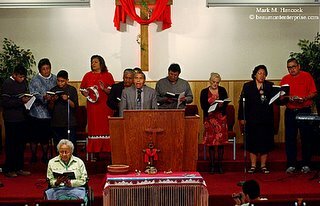 Church members sing gospel songs in the sanctuary during Indian Day at the Indian Village Assembly of God church near the Alabama-Coushatta reservation. 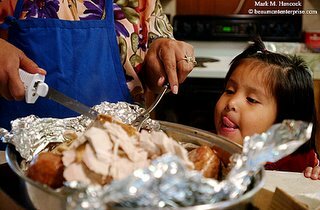 Please also see my Thanksgiving story and Fayrouz's take on the event on her blog. 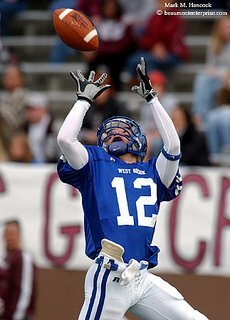 West Brook High School's Blake Kelly (No. 12) looks up to make a touchdown reception against Clear Creek High School during a playoff football game at Galena Park ISD Stadium in Houston on Saturday, Nov. 19, 2005. West Brook won the game and advances in the playoffs. UPDATE: The 2nd printing has SOLD OUT as well. Thank you for supporting the photo department and the United Way. 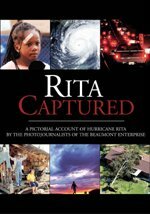 The Beaumont Enterprise produced a book titled "Rita Captured." Part of the proceeds go to the United Way Agencies to help out folks who were affected by this monster storm. It's an all-color, high quality bound book with about 170 pages of images. Anyone interested can pre-order the limited-edition book online through a secure Web site. It's a coffee-table photo book about Hurricane Rita as told primarily through the eyes of Jennifer Reynolds, Scott Eslinger and myself. Dave Ryan selflessly worked many hours to complete the book and get it to press. I've seen proof pages of the book and can honestly say it's the highest quality and most comprehensive look at this storm. For folks who lived through this storm or were smart enough to evacuate before it hit, the book is an essential keepsake. It covers everything from Winnie to Cameron, La. and from Sabine Pass to Jasper. 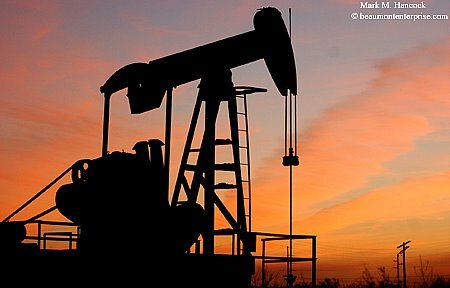 An oil pump works into the night in High Island on Wednesday, Nov. 16, 2005. This blog is maintained by Mark M. Hancock. I'm a Dallas-based pro photojournalist for magazines, daily newspapers and corporate clients. Some of my work is represented and distributed internationally by Zuma Press. Previously, I was an award-winning staff photojournalist for The Dallas Morning News (1996-2004) and The Beaumont Enterprise (Hearst Corp., 2005-2008) daily newspapers. In addition to my freelance photojournalism work, I'm also an Editor of books at Squadron/Signal Publications. This is primarily a photo blog. I try to post an image, photo story or video each day depending on my work schedule. Periodically, I post a detailed explanation of some aspect of professional photojournalism (PJ). Written photojournalism-related posts are linked on the sidebar under "All PJ-related posts." The end line "Enough for now," is also linked to All PJ-related posts. Photos and text entries are sorted by lables at the bottom of each post. Click on the lable to see the last 20 entries coded with the same lable. To browse all lables, see "All lables" near the top of the sidebar. If you would like to purchase an print for your home, please click the © symbol in the same post. Because I shoot for different clients, the link takes you to client-specific instructions to buy prints and/or reproduction rights from the copyright owner(s). All images presented since May 2008 are available on the sidebar link titled "Buy photos." Relevant comments are welcomed and encouraged. This blog doesn't allow anonymous comments. To comment, simply create a free Blogger profile here or use an Open ID. I try to answer most new questions in the same comment section, through a new text post or via e-mail. The right-hand sidebar contains links of interest for PJs and photojournalism buffs. The more popular links include: the PJ Candy Store (selected equipment and gear for PJs), Pix of the Day/Week, Major PJ contest calendar and links to other PJ staff, freelance, VJs (video journalisism), TV, collegiate and other photobloggers throughout the world. My wife, Fayrouz, is a Chaldean, Australian-Iraqi blogger. She has three blogs: Fayrouz in Dallas (current events), Fayrouz Break Room (humor) and Chaldean Thoughts (religious news). She provides commentary on current events, book reviews, occasional interviews and photos as well as relevant links on her blogs. Again, welcome to PhotoJournalism. Make yourself at home and the door is always open. 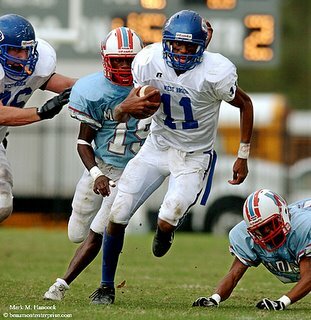 West Brook High School quarterback Joe Chaisson (No. 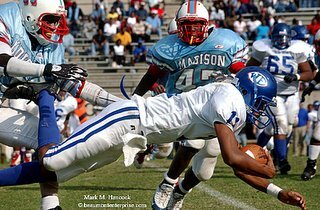 11, bottom) dives for a first down against James Madison High School during a football playoff game at Stallworth Stadium in Baytown on Saturday, Nov. 12, 2005. 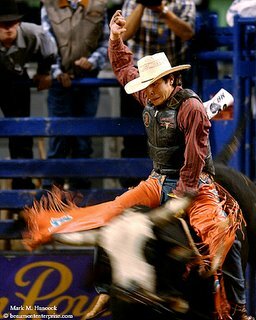 Nathan Foyil of Guthrie, Okla. rides Shimmering Oz during the YMBL Championship Bull Riding competition at Ford Park in Beaumont on Saturday, Nov. 12, 2005. 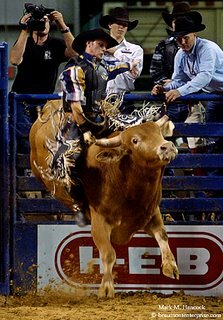 Daniel Phillips of Lamesa, Texas rides Fools Gold during the YMBL Championship Bull Riding competition at Ford Park in Beaumont. (Above) Bull fighter Blue Jeanes (right) watches as Seth Reynolds of Springfield, Mo. 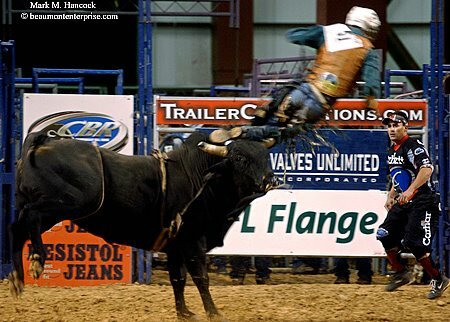 gets thrown during the YMBL Championship Bull Riding competition at Ford Park. (right) Cowboys reach to help Colt Munden of Springtown, Texas after he was injured during the YMBL Championship Bull Riding competition at Ford Park. Brookeland is a kindergarten-through-12 school in rural Southeast Texas. Last year, they had seven graduating seniors. This year they expect 12. As such, they don't have a football team. However, they take great pride in their basketball team. Before basketball season officially starts each year, they celebrate homecoming. It's akin to homecomings of yesteryear. The entire community is invited and involved in the celebration. (Above) Harleigh Sepulvavo, 6, (right) waits restlessly for the Queen's Court to begin with her father Durk Sepulvavo during homecoming activities at the school in Brookeland on Thursday, Nov. 10, 2005. 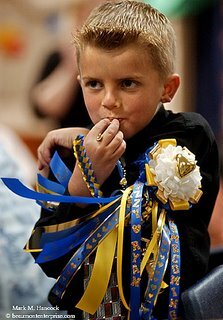 (Right) Ryan Whitmire, 6, blows a whistle on his boutonierre during homecoming activities in Brookeland. 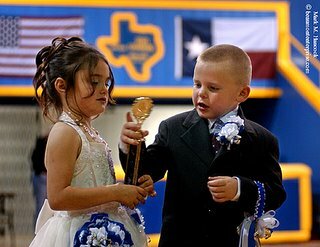 (Above) Kindergartener Hunter Spring (right) checks out the trophy of Queen's Court kindergarten dutchess Autumn Murray (left) during homecoming activities in Brookeland. 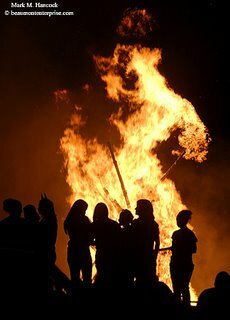 (Right) Brookeland High School cheerleaders mingle on a trailer near the traditional bon fire during homecoming activities in Brookeland. West Brook High School quarterback Joe Chaisson (No. 11, center) runs the ball for a touchdown thanks to a key block by Hunter Hamilton (No. 76, left) on James Madison High School's Michael Vinson (No. 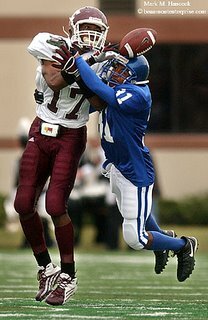 19, right of center) during a football playoff game at Stallworth Stadium in Baytown on Saturday, Nov. 12, 2005. Texas Highway 87 once connected Port Arthur to High Island and the Bolivar Peninsula through the McFaddin Wildlife Sanctuary. It allowed motorist to cruise between endless Texas shorelines and pristine salt marshes. 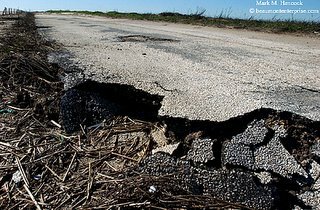 Previous storm damage destroyed the road. Consequently, the road was closed and motorists were forced to travel many miles around the obstacle. 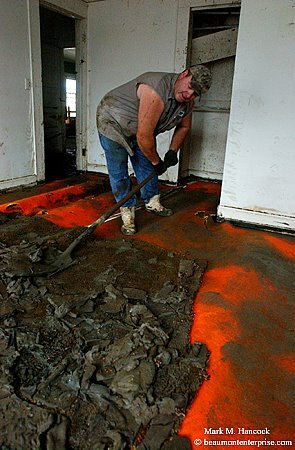 The area's protected status has made reconstruction progress slow. 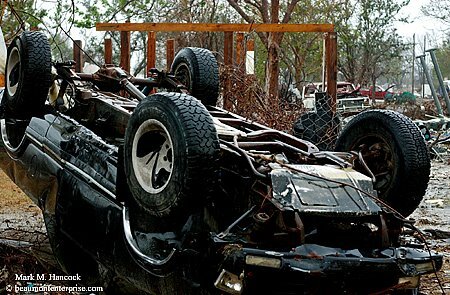 Hurricane Rita only aggravated efforts to rebuild the road. Solutions are being considered, but the road remains impassable. 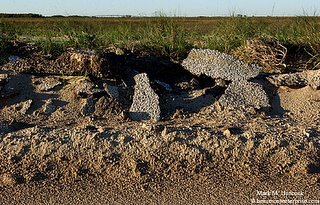 The asphalt is washed away near the end of Highway 87 in the McFaddin National Wildlife Refuge area near Sea Rim Park on Wednesday, Nov. 16, 2005. 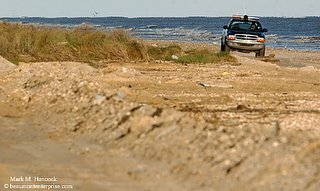 (Left) An officer with the oil spill division of the Texas General Land Office surveys the area beyond the end of Highway 87 in the McFaddin National Wildlife Refuge area near Sea Rim Park. 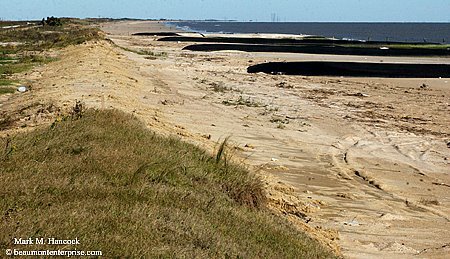 (Below) Exposed sand socks are washed with the tides near a washed-out dune near the end of Highway 87 in the McFaddin National Wildlife Refuge area near Sea Rim Park. 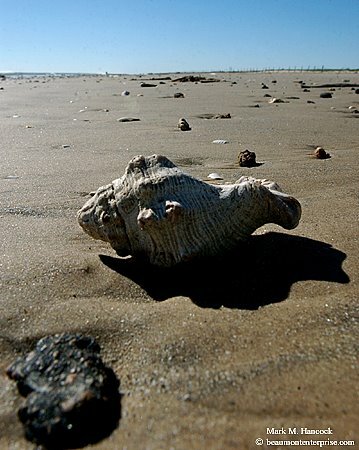 (Left) A sea shell and chunk of asphalt from Highway 87 coexist on the beach in the McFaddin National Wildlife Refuge area near Sea Rim Park. (Below) Pieces of Highway 87 mix in the sand in High Island. A U.S. Fish and Wildlife Service officer patrols the beach near the former Highway 87 route in High Island.